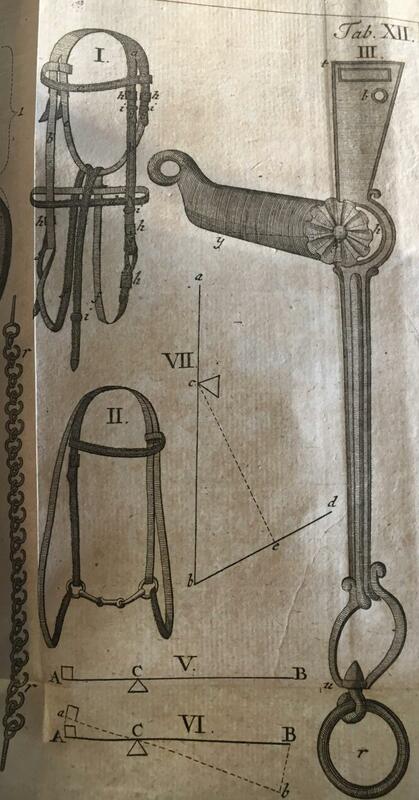 The most important bridling for the academic art of riding between 1550 and 1789, beside the cavesson, was the simple snafflecurb, which was called in France "simple canon". (Caution: this term is sometimes used in modern France today for a snaffle bit!). Because an art-rider needs a gathering effect of the bridle (I use "gather" here for the German word "beizäumen" and the French word "ramener"), to bring head and neck to a good uprighting for a suitable collection on the haunches, a curb is his means of choice. Is only one rein is pulled, only the leg on the same side is working, without tensioning the curb-chain; by pulling both reins simultaneously, the curbing action with pressure on the curb-chain occurs. (Caution: For testing the degree of tension of the curb-chain therefore one has to pull both reins simultaneously, to avoid a gross underestimation of the degree of tension!). The mouthpiece of the snafflecurb is broken once, it is called simple, if its legs are smooth, conically getting bigger from the middle to the outside, and holds no additional parts inside the horse's mouth (for inducing the playing of the tongue, for example). It is so thick according to La Broue and Gueriniere because the horse's lips shall bear a good part of its weight, and a tensioning of the reins is noticed first by the lips before reaching the horse's tongue or even the bars of the lower jaw: by this the horse gains time to adjust to the rein tensing and can react before the pressure rises. "[..] The mildest and best mouthpiece is a simple snaffle-curb ("simple canon"), which is called "canon a couplet": and the thicker the outer ends are, the milder it is, because it is less able to force the horse. In the well regulated schools one sees few or none at all of other bridlings, as it keeps the horse's mouth sane and entire, and because with it the tongue supports wholly the effects, and this part is not as sensitive as the bars, and the feeling is so fine, because the pressure of the bit goes obliquely over the whole tongue, and the horse obeys by the tiniest movements of the hand. Because when a bit touches the bars the mouth despairs soon. Finally one has to hold as a sure maxime, that with it we can teach the horse everything, shall say: if one can get from a horse every obeisance, which it is capable of, it would be pointles to force it with another one, because this is the best of all." Mouthpiece of the simple snafflecurb after La Broue with a fredom of the tongue he thinks will suit most horses, thickness at the outer side ar.3.0 cm. If both legs of the mouthpiece rise to the middle, they leave more space below them for the tongue, this is called the "freedom of the tongue". If this freedom is too high, the mouthpiece can touch the palate which irritates the horse greatly. And if on top of this a nose strap or cavecon is too tight, this situation gets even more severe, as the horse cannot open its mouth wide enough to avoid contact. Is the freedom of the tongue to low, the movement of the tongue and the ability to play with it, as the old wished, is impeded. 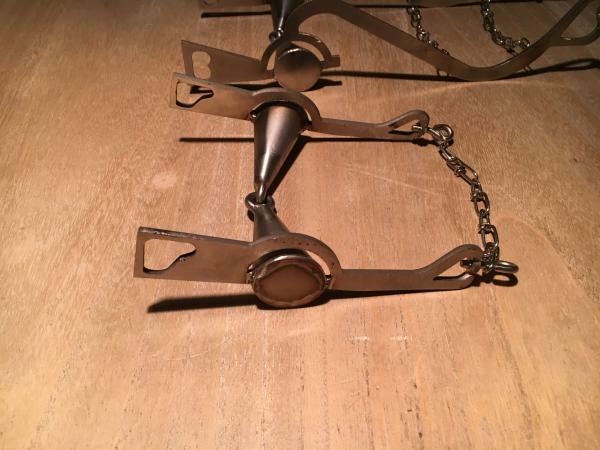 A snafflecurb must have a slobber-chain for preventing the upper shanks to fall into the cheeks of the horse by limiting the width for the lower ends of the lower shanks. A curb has two side-parts, called shanks, the mouthpiece is fixed between them. The shape of these shanks determine many of the effects of the mouthpiece. Pulling at the reins leads to a rotation of the mouthpiece and brings back the lower branch and forwards the upper branch. But even with reins hanging loose the curb can be working: the weight of the lower branch gives a little pressure on the curb-chain, if the horse has its nose into the air, until the horse has lowered the nose enough to be able to hold the bit with his mouth or until it is gathered as much as intended by the rider, in relation to the width of the mandibles for the throat, or to the lesson. The by many riders demanded always perpendicular front line is in many cases not possible nor called for nor making sense., and in some cases even a front-line of 45° (or even higher ) is the optimal. The French use the word „ramener“, which is mostly translated with "to bring head and neck of the horse to a beautiful poise", which sound less rigid. 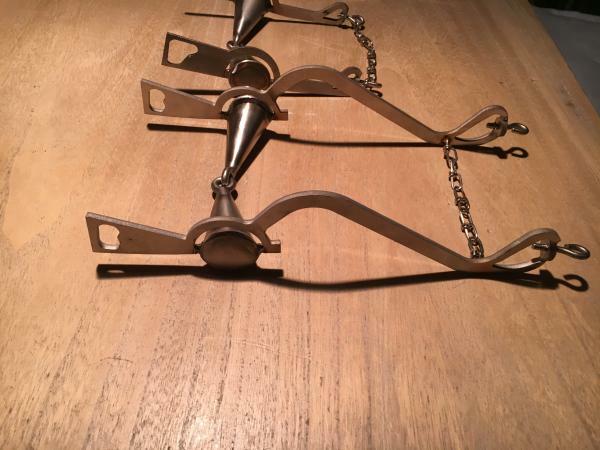 This action without any pulling at the reins is correct only when the lower branches are positioned according to this specific horse: most horses profit best from a normal one, which is called "on the line of the banquet", in German "beizäumend". Horses with a weak mouth or neck , with a tendency of rolling in the neck, or with to small Gamaschen, until the chin touches the breast, need shanks "behind the line" = weak ones, so that these horses can put there nose more forwards. Horses with a strong mouth may need shanks which end "before the line" =hard ones to get them into the right poise. In some parts the old masters write the horse's mouth should foam. The reasons for foaming is not swallowing the spittle and an increased production of saliva. Does this occur only because the horse is highly concentrated on its work, it is sometimes wished for, and a trembling of the lips often accompany it, but even then it should not be accepted for too long periods, naturally. Wenn das Mundstück zu sehr auf die Zunge drückt und diese vielleicht sogar anschwillt oder blau wird, ist das unerwünscht und gesundheitsschädlich, und ein zu dünnes Gebiss kann (auch bei einer einfachen Wassertrense) kann zu schweren Zungenverletzungen führen. Is the mouthpiece pressing onto the tongue too much, or the tongue is swelling or getting blue, this is an unwanted and harmful, and a comparably thin mouthpiece (even in a normal snaffle) can lead to massive injuries of the tongue. Today the part of the shanks above the middle of the mouthpiece is called the "upper branch" and the part below the "lower branch". The term upper branch was never used in olden times, it was called by La Broue and Gueriniere "banquet, with the eye of the banquet", later with Prizelius "Upper part", the lower branch was simply called "branch", in German "Baum". During these over 250 years the most important center of reference for the directions front and back was the "line of the banquet (front = to the front-line, back = to the lower jaw) and for up and down the "middle line of the banquet" (up = nape and down =chin of the horse). The mouthpiece was attached to the shanks at the middle of the banquet at the "bedding of the banquet" German: "Falz", (frz. „ply du banquet“), which in German was called "bottom", too. The upper part of the banquet shall be leaning back a bit, so in rest the eye of the banquet will be on the line of the oral fissure and the leather coil of the headpiece does not slide to the back end of the eye (La Broue). The lower branch can be made straight or curved. A straight one is recommended for the young, uneducated horse (together with the cavesson), at first without curb chain, later with it. Is the horse trained more, a curved one was recommended. The curve is generated by a higher place of origin of the lower branch, which leads to a stronger uprighting of head and neck of the horse, the higher it is placed. Gueriniere shows as a normal height one of a 45° in regard to the middle of the mouthpiece This bow is called "coude " in French, "Bug" in German. An important intensifying role plays an increasing distance of the coude behind the line. 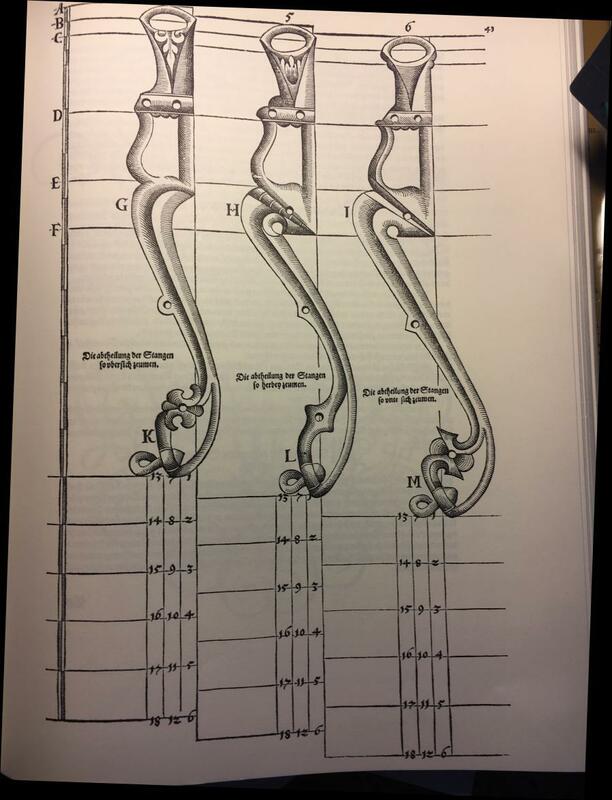 Löehneysen, La Broue and Gueriniere are of the opinion, that a changing of the coude alone is useless without changes to the lower branches, but Prizelius thinks the bow and the lower branches can be changed separately with realizing an effect, ( His sketch in his book 1777 unfortunately was shown incorrectly, I have corrected it here) In this sketch there is no lower branch "behind the line", but only one on the line and four more in a rising hardness "before the line". The very high departures 4 and 5 of the coude in Prizelius‘ sketch are not to be found in old depicitions, which comes to no surprise, as in the dictionary in the french Eisenberg it is explained that those would lead not to a higher elevation but instead to the horse taking his head between its legs. The ratio of the lengths of upper to that of the lower branch is an important indicator of the force effect of the curb (in Gueriniere's sketch it is 1:3). The full force is as good as never used in the academic art of riding, because here the horses are ridden solely on a curb bit only after having been trained for years together with a cavesson and have learned to react nearly completely on the seat aides, including a full halt. Should it happen that the an art-rider feels the need for a too hard force on the bit several times in a row, he will take again a cavesson additionally for some time, to keep the horse's mouth a sensitive as possible. The length of the upper branch is important,too, because according to La Broue the force on the curb chain rises with the growth of its height. He recommends a height of 4 fingers (ar. 6cm), but important deviations may be necessary because of the size of the horse's head or mouth fissure. In horses with a weak mouth and an inclination to roll in their neck it is recommended to use a curb behind the line: this leads to a stop of the ends of the lower branches at the breast of the horse, which then stops the now useless pressure on the bars. Also the rider may try to use this now occurring pressure of the ends of the lower branches to try and teach the horse this as backwards signal (of course in addition to the seat aides and possibly the cavesson). Should the lower branch not be shaped exactly adequate, one can help himself with adjusting the tension of the curb-chain for a weaker or harder effect. All in all the simple snafflecurb is for the intended use the mildest, gentlest and most effective bridle, first together with the cavesson, to familiarize the horse with the intentions of the rider, and after having finished its "squire-time", without it (adding it again if problems occur or a new lesson is to learn). Incidentally the duration of cavesson use has always been disputed: so thinks Claudio Corte in his "Il Cavallerizzo", 1562: "Has the horse reached this ripeness, I would advise to take off the cavesson, and to use false reins [additionally to the curb-reins;DA] only for a short time, and not, as diverse men do, use the cavesson for months, years or whole ages of men, before make up the horse...." (After the translation by Thomas Bedingfield, "The Art of Riding", p.57; 1584) . A good posture of head and neck is important for the physical and mental health of the horse. For each of the different types of horses the best posture is differently and accordingly to the form and strength of the hind quarter, the forehand, the type of the neck, the Ganaschen, the mind of the horse and not according to the present work task of the horse. La Broue says it thus: „The horse shall hold head and neck in its middle and most beautiful posture”. The emphasis here lies on “its”! For an English full-blood during a race it may be the best, to hold “its nose into the wind” or “Wear the nose as high as the ears”. But in the academic art of riding we want to achieve a strong collection on the hind legs, to achieve the best possible turnability (on the hind legs), that means sufficient bearing power in the hind legs and the possibility of a great freedom of the shoulders (from weight). A well schooled, full-grown horse adopts during a calm collection a good posture by its own, here the French word “ramener” / “r’amener” suits better, because it means “fetching towards” : this the horse can do on its own, without any effect by a bridle. The German word „beizäumen“ (= bridling towards) does not allow this utilisation. A young horse (as the 5-6 year old ones are called in the academic art of riding, even younger should perhaps not be troubled with any curb) , can learn to achieve this posture faster and better, if an appropriate bridling is used. The best for this is a curb, which during the heyday of the academic art of riding in the utmost cases was a snaffle-curb. Contrary to every other bridling, a curb lifts up the nape of the horse (elevating effect) and simultaneously brings the nose downwards, which in the ideal case leads to a beautiful, evenly arched upper neckline. Is the curb build in a way that it effects a too strong auto-curbing, an uprighting/erection of the forehand is impossible, or only a false one by strongly working the spurs (the latter leads to double discomfort for the horse: it has to endure the spurs and the pressure of the chin-chain, too, and additionally is often leading to a false kink in the horse’s neckline). Also, bringing the horse to collect its forces by a too strong curb will lead to a collection on the forehand. In extreme cases the horse then will bring its nose close to the ground, creating in effect a gradient of collection near zero. The auto-impact of a too strong curb impedes: a far-reaching out in all gaits (the famous spacious walk of the Knabstrupper for example), and also a sufficient load-discharging of the forehand (which means that a beautiful,relaxed school-halt, the Terre-A-Terre, a beautiful school-canter and a beautiful lifting of the forehand are impossible); and the desired maximal gradient of collection for the specific horse in the specific lesson cannot be achieved. Is on the contrary the build of the curb rather too weak, the rider can counteract this weakness by pulling at the rein precisely that amount of pressure on the chin-chain he thinks necessary at the moment, to gain the sinking of the nose he wishes for (= tilting of the front line of the horse’s head) should he feel, that the auto-curbing is not sufficient. The most important goal for us in the academic art of riding thus is to find a curb, which allows the maximal gradient of collection: if then it feels to weak, we can always add curbing-impact by our hands. Maxim: “Better too weak than too strong”! 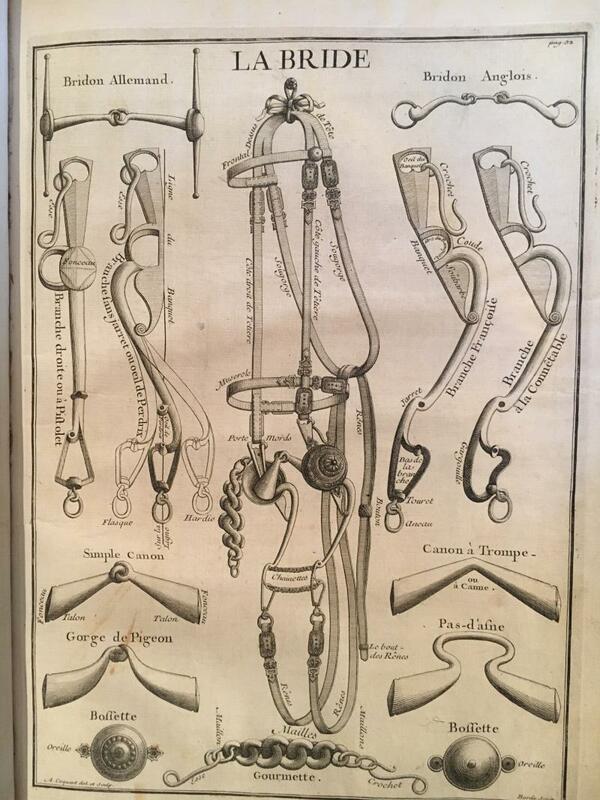 Reasons for choosing a too strong curbing bridle on the other hand can be: the rider has not much confidence, and wants, being a beginner, rather not the maximal uprighting (and accepts as a backlash having to drive the horse much more); or he might want to attach the reins to his belt and ride with free hands; or he wants as a western-rider to put the horse on the forehand, with a consecutively sinking down of the head, to get it out of the lasso’s way; or he wants to train a war horse for the fighting in the turmoil to achieve a low school: here it is important, that the horse doesn't loose its equilibrium, if impacted by other horses, which easily might lead to an overturn of horse and rider; also a low posture of the horse's head allows all-around hits with the sword much better: these horses are trained only in the low lessons, for example the Terre-A-Terre, which lets the horse stay near the ground always, but they are never trained in the elevated schools, so that they won't accidently execute these of their own volition during the fighting. Contrary to that a war horse for fight dules one against one needs to be high schooled and gets a weak curb: important is for these being able to execute a good sword-passade, at which's end follows a swift, precise turn, to attack the enemy again: for this the horse needs a high elevation of the forehand, which in this case is not nearly as dangerous, because the only two riders and horses can far better observe the other, and an impact of the horses happens far more seldom; here even a Capriole, where the horse is completely in the air, is not as dangerous for loosing the equilibrium. As La Broue writes, with an excellent rider-horse pair also the jump forwards off the hindlegs in a Courbette can be a big advantage in a duel. The horse's head is not in the way so much, as the rider can position his horse far better to the only enemy (which hopefully happens to be the sword-hand side!). In the old depictions one can often find a horse with a "falling-through" curb (= the lower branches are in a right angle to the horse's mouth fissure): This can mean that the rider is not able during a fight for his life to finely handle the reins, which means that then the reins are pulled far too much, which can result in damages to the horse's mouth; or it can mean a: that the rider was so prescient to loosen the curb-chain before the fight, to prevent this damage, or b: he loosened it to reduce the elevation of the forehand and consecutively lower the chances of the the horse rising up from the earth; or c: because now only an effect similar to a normal snaffle occurs, this will lead to the horse leaning onto the bit, which in turn leads to a lowering of the head, proper for sword-fighting all around. If the rider wants to permit his low schooled horse to wear its nape somewhat higher, he doesn't have to alter his curb behind the line of the banquet, he can at first try to gain a higher elevation be loosening the curb-chain a bit. The same is valid the other way around: if one wants to reduce the elevation in a high schooled horse, one can reach this to some dgree by tightening the curb-chain.